Fantasy Glassworks personalized Stemless Red Wine Glasses is a modern wine glass that have no stem or pedestal, it is essentially "Stemless". It makes the perfect gift for any wine enthusiast. The personalized Stemless Red wine glass may be customized to your specifications. Text, logo, artwork, it may all be used on the personalized Stemless Red Wine Glass. 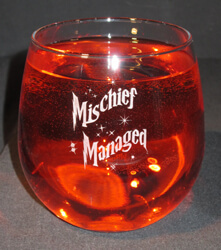 All engraving of the personalized Stemless Red Wine Glasses is done in house by Fantasy Glassworks, and both are manufactured by Libbey Glassware.